Citation: Preti A. Undiagnosed ALCAPA presentation at the preoperative anesthesia clinic. Anesthesiol Case Rep. 2018;1(2):20-22. Anomalous origin of the left coronary artery from the pulmonary artery (ALCAPA) is a rare congenital anomaly first described in 1908  and has an incidence of 0.26% of all cases of congenital heart diseases . The left coronary artery arises from the pulmonary artery, instead of branching from the aorta. ALCAPA is usually an isolated cardiac anomaly but, in rare incidences, it has been described with other congenital heart defects. These other congenital heart defects are: Patent Ductus Arteriosus, Ventricular Septal Defect, Tetralogy of Fallot, and Coarctation of the Aorta. The usual clinical course is severe left-sided heart failure, myocardial necrosis, and severe arrhythmias during the first few months of life, when the pulmonary vascular resistance drops . Nearly 90% of patients die within one year if left untreated; however, a few patients can survive into adulthood; this depends on the inflow of blood to the left coronary artery (LCA) via collaterals from the right coronary artery (RCA) . The adult form of ALCAPA may occur in approximately 10-15% of cases. A high proportion of them present with impaired LV contractile function associated with severe dilated cardiomyopathy and significant mitral regurgitation. Other presentations are exertional angina, acute myocardial infarction, malignant arrhythmias or sudden cardiac death . We report a case of a 45-year-old woman referred to the anesthesia clinic in April 2017 for a laparoscopic hysterectomy under general anesthesia. She was found to have a heart murmur at the age of 23 while pregnant and was seen by a cardiologist who diagnosed a patent ductus arteriosus. She underwent regular follow-ups with a cardiologist. She was on no medications. She is a non-smoker. She had four normal vaginal deliveries and general anesthesia for an appendectomy in childhood and a LLETZ procedure (Large loop excision of the transformation zone of the cervix) as an adult, which all went uneventfully. The patient described recent symptoms of exertional chest pain and shortness of breath for the last 6 months. Her medical examination revealed the systolic murmur already known. 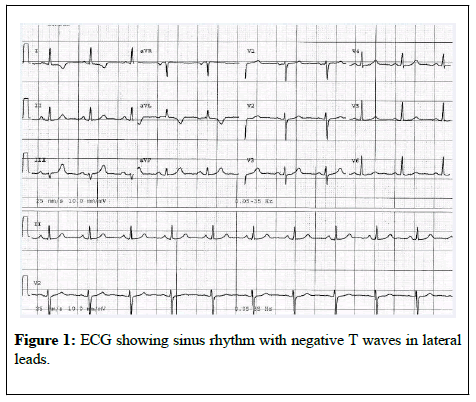 Electrocardiogram demonstrated sinus rhythm and negative T waves in leads I and aVL (Figure 1). Figure 1: ECG showing sinus rhythm with negative T waves in lateral leads. The patient had recently received a hysteroscopy and dilatation and curettage on February 2017. The general anesthesia for hysteroscopy was accomplished with intravenous (IV) midazolam (0.03 mg/Kg), fentanyl (1.5 μg/Kg) and propofol (2 mg/Kg). Laryngeal mask airway was inserted, and mechanical ventilation was instituted. Anesthesia was maintained with sevoflurane and oxygen-air mixture. Monitoring consisted of non-invasive arterial pressure (NIBP), ECG, end-tidal carbon dioxide (EtCO2), and pulse oximetry. The anesthesia lasted 30 min and was uneventful. The patient was then referred to a cardiologist at the recommendation of the anesthesiologist for a review with a view of the upcoming laparoscopic hysterectomy. In May 2017, a transthoracic ultrasound detected an anomalous vessel arising from the right atrium around the lateral wall but was inconclusive. Left and right ventricles were of normal size and function. All the valves were normal. A CT coronary angiogram in May 2017 showed dilated tortuous right and left coronary arteries, with dilated intercoronary collaterals. An anomalous left coronary artery was emerging from the pulmonary artery (ALCAPA). There was no evidence of patent ductus arteriosus (Figure 2). Figure 2: 3D reconstruction of CT scan of the heart showing the origin of the left coronary artery from the pulmonary artery. Collaterals from right coronary artery filling left system. PA (pulmonary artery), LAD (left anterior descendant artery). A sestamibi (MIBI) scan was performed showing areas of reversible anterolateral ischemia extending into the anteroseptal wall suggestive of exercise-induced ischemia. The study demonstrated normal left ventricular wall motion and systolic wall thickening in all segments with an ejection fraction of 57% post-stress. The patient was referred to a cardiothoracic surgeon and underwent ALCAPA repair (Takeuchi Procedure) in September 2017. The Left main coronary artery was transferred from the main pulmonary artery to the aortic root. The main pulmonary artery was repaired with a bovine pericardial patch. After the ALPACA repair, the patient no longer had symptoms of chest pain or dyspnea and was referred back to the gynecologist. A laparoscopic hysterectomy was performed under general anesthesia in January 2018. The general anesthesia was accomplished with IV midazolam m (0.03 mg/ Kg), propofol (2 mg/Kg), fentanyl (total dose of 5,4 μg/Kg) and rocuronium (0.6 mg/Kg). The endotracheal tube was inserted, and the patient was mechanically ventilated. Anesthesia was maintained with sevoflurane and oxygen-air mixture. Monitoring consisted of NIBP, ECG, EtCO2, and pulse oximetry. The anesthesia lasted 150 min without cardiac events. Adults with ALCAPA syndrome can survive till adulthood, due to welldeveloped collaterals from RCA, which provides adequate perfusion to the left ventricle. The coronary angiogram is the gold standard investigation for diagnosis of ALCAPA and was determinant in correcting the previous diagnosis of ductus arteriosus in our patient. The RCA was dilated and tortuous as expected. In adult life, symptoms may range from exertional angina and dyspnoea to severe heart failure, mitral valve insufficiency or arrhythmias, and sudden cardiac death. Our patient presented with exertional dyspnoea and angina which started at the age of 45. Yau et al. in their review of 151 adult ALCAPA cases reported that on examination about 87% of the patients had murmurs. Our patient was known to have a murmur but was misdiagnosed with a patent ductus arteriosus. Abnormal q waves in the lateral leads (I, aVL and V4-V6) are commonly seen in ALCAPA  but were absent in our patient who had negative T waves in leads I and aVL. Echocardiography could identify the abnormal origin of the LCA, but other findings frequently reported are dilated RCA, retrograde filling of the anomalous coronary, abnormal diastolic flow in the main pulmonary artery, mitral valve prolapse, and abnormal septal or epicardial color flow signals from the collaterals . In our patient, the echocardiography was not determinants in detecting the cardiac anomaly. Soon after birth, the resistance of the pulmonary circulation is high, permitting antegrade flow from the pulmonary artery (PA) to left coronary artery (LCA), which perfuses the left ventricle. As pulmonary vascular resistance falls in the first few weeks of life, the increased pressure in the LV will prevent the flow from PA to LCA and the left ventricular perfusion totally depends upon collaterals to LCA developed from the RCA. Death ensues if collaterals are poorly developed, while on the other hand if collaterals open up after an initial period of decompensation, improvement and survival into adulthood occur. Early autopsy studies indicated that the average age of sudden death in untreated ALCAPA was around 35 years . This led to advocate for all adults with a diagnosis of ALCAPA to undergo early surgical treatment. If the anomaly goes undiagnosed before a general anesthesia, there is a risk of runoff of blood through the collateral system from the coronary artery with aortic origin when high FiO2 is administered and PaCO2 in the blood is decreased because of increased minute ventilation and pulmonary artery pressure (PAP) falls. This decrease in PAP increases stealing, resulting in ischemia . Increased myocardial O2 demand from tachycardia or fluid loading can further exacerbate the problem . The ECG can show signs of ischemia, pulmonary edema and low CO from acute LV dysfunction or cardiac arrest  can also occur. Late complications are common after correction of ALCAPA. On a mean follow-up duration of 16 years after LCA implantation, cardiovascular events that comprised heart failure, mitral valve regurgitation, main pulmonary artery stenosis, arrhythmias and cardiac death occurred . Meticulous lifelong follow-up in a center experienced with caring for adults with congenital heart disease is warranted. The preoperative anesthesia clinic was paramount in detecting signs of ischemia in a low-risk patient, which lead to a diagnosis of a rare congenital anomaly and the prevention of major cardiac complications and sudden cardiac death. Bland EF, White PD, Garland J. Congenital anomalies of the coronary arteries: report of an unusual case associated with cardiac hypertrophy. Am Heart J 1933;8(6):787-801. Cherian KM, Bharati S, Rao SG. Surgical correction of anomalous origin of the left coronary artery from the pulmonary artery. J Card Surg 1994;9(4): 386-91. Wesselhoeft H, Fawcett JS, Johnson AL. Anomalous origin of the left coronary artery from the pulmonary trunk. Its clinical spectrum, pathology, and pathophysiology, based on a review of 140 cases with seven further cases. Circulation 1968;38(2):403-25. Keith JD. 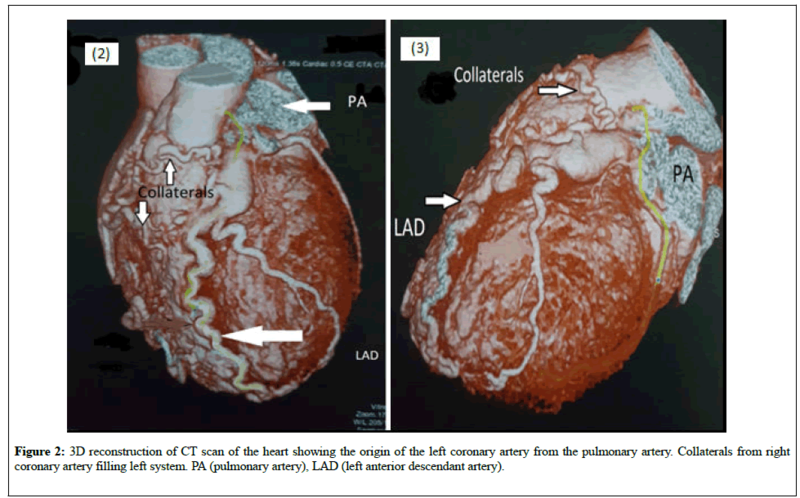 The anomalous origin of the left coronary artery from the pulmonary artery. Br Heart J 1959;21(2):149-61. Fernandes ED, Kadivar H, Hallman GL, et al. Congenital malformations of the coronary arteries: the Texas Heart Institute experience. Ann Thorac Surg 1992;54(4):732-40. Yau JM, Singh R, Halpern EJ, et al. Anomalous origin of the left coronary artery from the pulmonary artery in adults: a comprehensive review of 151 adult cases and a new diagnosis in a 53-year-old woman. Clin Cardiol 2011;34(4):204-10. MJ Varghese, SS Kothari. The caveats in the diagnosis of anomalous origin of left coronary artery from pulmonary artery (ALCAPA). Images Paediatr Cardiol 2010;12(3): 3-8. Frommelt MA, Miller E, Williamson J, et al. Detection of septal coronary collaterals by color flow Doppler mapping is a marker for anomalous origin of a coronary artery from the pulmonary artery. JASE 2002;15(3):259-63. Jurishica AJ. Anomalous left coronary artery; adult type. Am Heart J 1957;54(3):429-36. Lee F. Anesthesia and Uncommon Diseases. Sixth Edition 2012. Arya VK, Bangaari A, Rajeev S, et al. Intraoperative myocardial ischemia during renal transplantation caused by anomalous origin of the right coronary artery. Ann Card Anaesth 2009;12(1):57-62. Heidegger T, Waidelich E, Kreienbuehl G. Anomalous origin of the left coronary artery: discovery during an ambulatory surgical procedure in a 3-month old, previously healthy infant. Ped Anesth 2001;11(1):109-11. Kanoh M, Inai K, Shinohara T, et al. Outcomes from anomalous origin of the left coronary artery from the pulmonary artery repair: Long-term complications in relation to residual myocardial abnormalities. J Cardiol. 2017;70(5):498-503.